The spiritual practices of Flores are unlike anywhere else in the world, a blend of mystical folklore tempered with traditional religious teachings and beliefs. With many distinct religious groups, the people of Flores live harmoniously, and have a mutual respect and understanding for the diverse cultures and practices that make up the region. Local spiritual beliefs and custom sit alongside churches and mosques, with this devotion to faith bringing an underlying sense of quiet calm that colours everyday life. 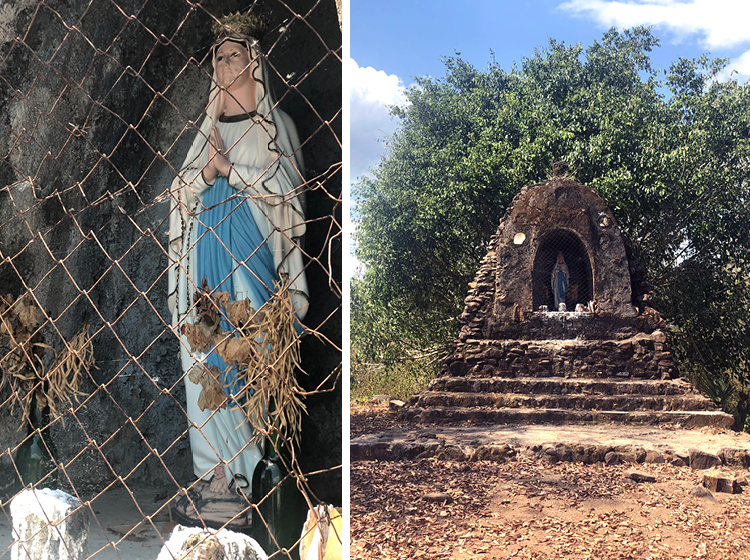 Many houses in the area have shrines or large religious icons built on their property, a striking feature as our team from the Voice of Flores recently discovered. While exploring the stunning hinterland area our explorers came across a shrine hidden behind the trees and vegetation, at the end of a set of stairs concealed in the ground. What they found was a beautifully ornate and well-kept shrine, used as a place of worship by the local community. This was no secret to the Flores children who had followed the visitors to their ‘discovery’. Lots of smiles and giggles ensued as the team asked about the history of the shrine and chatted with the children. The influence of the Portuguese traders and missionaries who named Flores in the 16th century is still seen in the architecture and many of the practices of the area. The Portugese brought Catholicism with them in an attempt to convert the local people from their old beliefs and customs. Today, the Catholic faith is the most widely practised on Flores, and the church is a hugely important part of family life. Often church ceremonies can last all day, particularly on significant dates such as Christmas. However the people of Flores didn’t forget their own culture, and today the practice of ‘animism’ exists alongside the teachings of the church. Animism is best described as the attribution of a soul to plants, animals, inanimate objects and natural phenomena occurring in the environment. Followers of animism hold the belief that a supernatural power organises and structures the life, death and fate of all animate and inanimate bodies in the universe. Believers of animism hold ceremonies giving thanks to the natural world or Mother Nature for providing for last year’s harvest, and offer sacrifices as gifts for the provision of the coming harvest. Indeed, the practice of animism is most likely linked to the ancient connection and reliance that the people of Flores have always had for the land on which they live. The Penti Ceremony in Wae Rebo is a perfect example of the animistic belief system; please refer to our calendar for dates of significant ceremonies and feel free to respectfully watch or join in, but always ask permission first. Part of animism is the value placed on all life, and a conviction that every being holds importance in the cycle of life. For example in our interview with the fabulous Megah, we learnt about the whale hunting ceremony that takes place in Lembata. It isn’t the mass whale slaughter and mindlessness that we see in other parts of the world, but the symbolic and revered hunt of a single whale. The entire whale is then used within the community, offering food, shelter, and medicine to all the people in that area. There are ceremonies giving thanks and respect for the capture of the whale and for providing for an entire community. The Bajau people of the region, sea gypsies, brought many things with them to Flores, spices, gold, sea trade and the Islam faith. You will see Islam being practiced in parts of Flores along the coast in areas influenced by the Bajau people or in areas where migration from Islamic Indonesia has occurred. However they also practice a type of animism as they believe in honouring the spirit world of the sea, which must be revered and appeased with offerings and rituals. These distinct religious groups, Islam, Catholicism and animism co-exist peacefully, side by side, without conflict, or dogmatic fundamentalism marring their devout lifestyle. It is a rare departure from the ways we are used to viewing religion, and it would seem that this in part owes to the unique characteristics of animism that unite the groups. A connection to the land and sea, the recognition of the power of natural forces and a deeply held respect for the cycle of life underpins the spiritual peace that governs the people of Flores. Despite the external influences of migration, early exploration and changing religious values of its people, shifting industry and new ways of living, the people of Flores have maintained their faith in nature, and when you visit the region, it isn’t hard to see why. For more on the ceremonies held in Flores, please see our online calendar of events. We would love to hear more about your spiritual experiences in Flores, so please contact us via the website and we will tell your story and the story of your people.